Taking place tomorrow night, this event seems to have captured the imagination of the whole of Scotland! 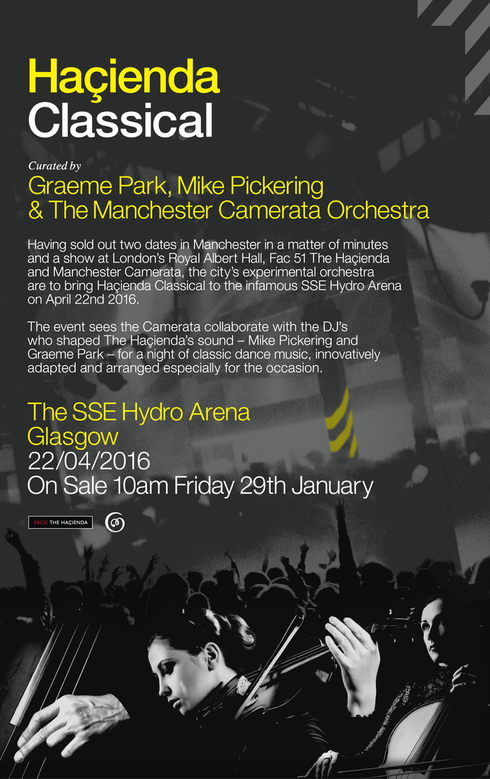 Having apparently sold out two dates in Manchester and a night at London's Royal Albert Hall in a matter of minutes, Haçienda Classical's first Scottish concert comes in conjunction with UK promoters, Colours, at Glasgow's SSE Hydro Arena on Friday 22 April. The events sees FAC 51 The Hacienda and Manchester Camerata collaborate with the DJs who shaped The Haçienda's sound – Mike Pickering and Graeme Park. For those who’ve still to get their ticket, check out the video below to give you a taster of what to expect. We can't wait for it!